It has become common practice for a client in the UK construction industry to require its contractor to provide security. Performance Bonds and Parent Company Guarantees are two forms of contract to handle this requirement. Especially in times of uncertainty, anyone awarding a valuable contract will need to think about the financial and technical capacity of the contractor, not least in the building industry where insolvency is all too common. Partly in consequence of this risk, it has become common practice for a client in the UK construction industry to require its contractor to provide security – in the form of a performance bond and, especially where the company entering into the contract has limited assets but is part of a larger group, a guarantee from its parent company. These requirements are usually included as a term in the contract between the client and the contractor and it is sometimes a condition of receiving payment under the contract that the performance bond and parent company guarantee are in place. Who Will Provide the Guarantee? It is usual for the ultimate holding company of the contractor to be asked for the guarantee, but this is not always the case. For example, if there is an intermediate company within a group which has sufficient assets, the client might be willing to accept such a company. Moreover, sometimes this is to the advantage of the beneficiary, i.e. the client. For example, if a contracting company incorporated in England is ultimately owned by a US corporation, the UK client needs to consider whether it may have difficulties in enforcing the guarantee if for any reason the parent company does not pay when called upon to do so. The chances are that legal proceedings in the United States could be necessary. So, if in the group that owns the English contracting company, there is an English “parent” that has adequate assets, the guarantee might best be obtained from that English parent. A parent company guarantee creates a contract between the client and the guarantor. 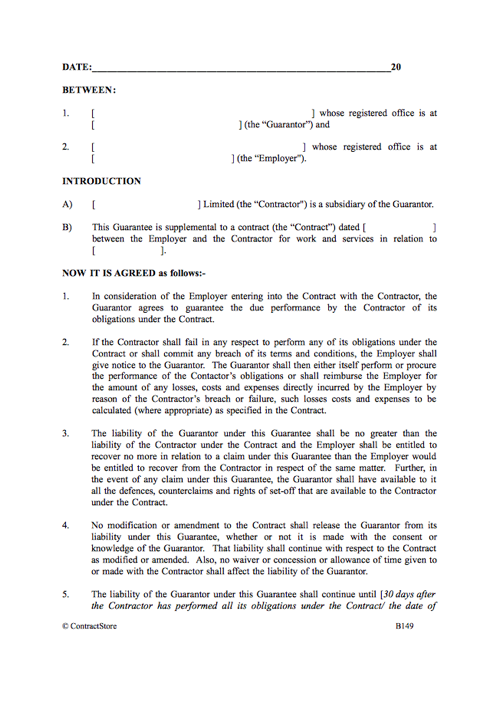 It will specify the guarantor’s duties and usually have an end date – e.g. the date of completion of the project, after which it ceases to have any effect. The guarantor will specify when it comes into effect and what are the guarantor’s obligations – e.g. to take over the project from its subsidiary if the subsidiary becomes insolvent or ceases to perform its contract. Often there is a wide indemnity clause under which the guarantor indemnifies the client against all losses it suffers as a result of the subsidiary’s default. If you represent a parent company being asked to provide a guarantee, you should try to ensure that your liability is no greater than that of your subsidiary under its contract with the client. In other words, if the contractor’s liability is limited to a fixed amount, this should apply to the guarantee. And if the contractor is owed money by the client, it can be useful for the guarantee to give the guarantor the right to withhold an equivalent amount from what it has to pay the client under its guarantee. Without appropriate wording, the guarantor can find itself liable for more than its subsidiary. Parent company guarantees do, of course, come with the risk that if the contractor company is in trouble, its parent may be in trouble as well, so a call on the guarantor can turn out to be worth less than it seemed. Which only goes to underline the fact that due diligence is needed before any major contract is signed. This entry was posted in Online Legal Templates and tagged construction contracts, parent company guarantee, performance bond. Bookmark the permalink. Previous Post: Are Your Gym Membership Terms Illegal?